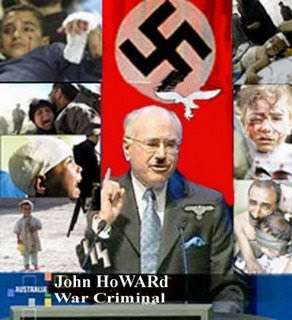 PM HoWARd still a great war criminal? John Howard has become Australia's second longest serving War Criminal? John Howard today becomes Australia's longest serving war criminal, with the latest poll showing he remains the corporate media's firm favourite. Today's plebiscite statistics indicated by the corporate media are flawed, as usual and has Labor recovering from its post-election slump to be just four points behind the Coalition after preferences? But we're into divorcing the Federal Government! Why? Because it is corrupt and misleading - using the media to maintain its status quo. And even when one party or another draws close to the neo-Liberal party the media call it "neck a neck", especially preceding and election. Have you noticed? The US election was "neck a neck" and so it goes. ABC : "Mark Latham's support as preferred Prime Minister has dropped to 24 per cent, while 60 per cent of voters prefer John Howard. "On the question of who is best to lead the ALP, Mark Latham has less support than former leader, Kim Beazley." "Former prime minister Bob Hawke, who had worn been the nation's second longest serving leader, has acknowledged the milestone."? Bob Hawk: "Obviously he is a very accomplished political operator," Mr Hawke said? And Liberal backbencher Wilson Tuckey does not want his leader to stop there. "He has the potential to catch Bob Menzies if age will permit it," he said. HoWARd will celebrate with a family dinner tonight most likely a toast to his achievements? Just as another couple of hundred deaths in Iraq yesterday! Innocent men women and children killed in Iraq without whose cause they may have survived today to celebrate with him? If it hadn't been for the illegal and degrading war on the sovereign nation of Iraq over 100,000 innocent men, women and children may be alive today to celebrate with him? So How Great is HoWARd? However Mr Hawke says time in office does not necessarily imply he is the second greatest leader. "I don't think either John or myself would say that the longevity of itself is a determination of greatness," he said. What better reason to divorce the federal government when the only statement by the Opposition in defence of warmongers and war criminals like the HoWARd Government and his cronies is about their greatness? greatness noun: Greatness: Something meriting the highest praise or regard: glory, grandeur, grandiosity, grandness, majesty, splendor. Bob Hawk is saying what TIME Magazine is saying about Bush in a lot of ways but no commitment about the real truth of the matter? Sounds like the Bold and the Beautiful! That is unless your regard 'war criminal' as a class of greatness? I strongly suggest that voting for Lib/Lab would be a grave mistake if you want to stay liberated. war crime n.: Any of various crimes, such as genocide or the mistreatment of prisoners of war, committed during a war and considered in violation of the conventions of warfare. Warmonger Foreign Affairs Minister Alexander Downer should have entered the record books after the attack on Iraq as Australia's longest serving war criminal in the portfolio and taken to the Hague for trial. Foreign Minister Alexander Downer is refusing to comment on whether he has been approached to replace Mohamed El Baradei as the head of the United Nations' nuclear watchdog. The Federal Opposition has described the Government's failure to release the final report into the claims of intelligence failures within the Defence Department as a cover-up. ASEAN leaders pressed HoWARd to rethink his rejection of South-East Asia's non-aggression treaty. Greenpeace has called on the Federal Government to end its support for research on uranium enrichment carried out by a private company at the Lucas Heights facility in Sydney. The United States looks set to test new generation weapons, including dumb bombs, in Australia within three years? In a speech to the Senate last night, Senator Bartlett said that the Democrats support the US-Australia alliance, the ANZUS Treaty and appropriate defence and intelligence cooperation but not subservience. US Foreigner Alexander Downer says he is investigating whether the media was tipped-off ahead of yesterday's car bomb attack on an Australian military convoy in Iraq. This is a small attempt to answer how we have ended up with an increased Liberal majority in government, when they have done so much long term harm to our country. Prime Minister John Howard "the rodent type" has begun his fourth term in office with a quiet day in Sydney after the Coalition's victory in the federal election. Australian caretaker Prime Minister John Howard 'a rodent type' does not need to apologise for the illegal and degrading war in Iraq despite a new report that has found Saddam Hussein did not have weapons of mass destruction at the time of the US-led invasion.